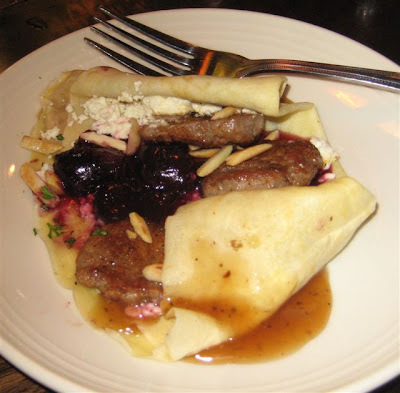 Peppered Lamb with Cherries Reduction Crepe (my personal favorite) paired with Classic Red Sangria. 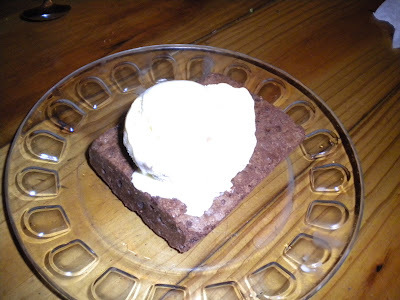 Recently, with the help of my friend and fellow blogger Malika (see her post here), I was invited to a blogger's tasting at Crepe Revolution in Smyrna. Not one to normally venture out to Smyrna, this was a good excuse to visit a new place one evening after work. 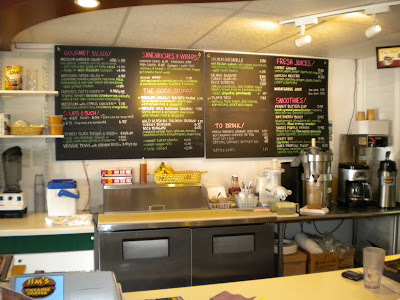 After living in France for a summer, I can say that crepes are one of my favorite foods and although Crepe Revolution's rendering of crepes is not quite what I'm used to, I do recommend the place and admire its concept and commitment to bringing a quality product to consumers at a decent price. Ginger Crab Rolls, paired with White Peach Sangria. The tasting I attended paired new menu items with the restaurant's new line of sangrias. 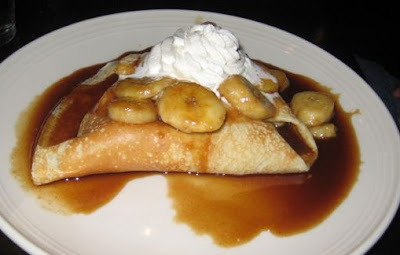 We also tried the bananas foster crepe (delicious - photo below) for dessert, which is a menu mainstay. 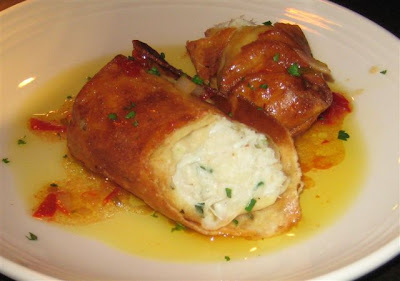 My favorites include the ginger crab rolls - lots of delicious crab and a hit of ginger make this roll really stand out. 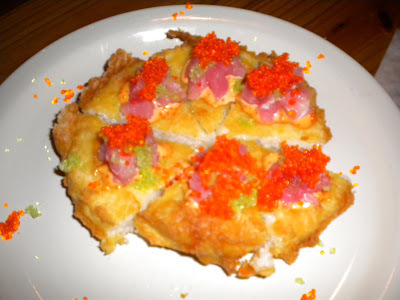 Although the tastes were relatively similar I also enjoyed the Thai chicken purses, below. My favorite, however, is definitely the lamb. 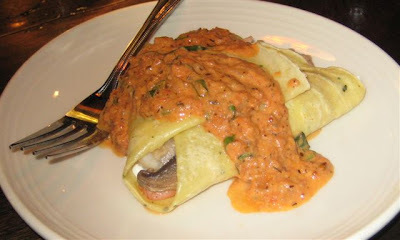 I've never before enjoyed lamb in a crepe, but the flavors are amazing. There is cheese inside the crepe, which allows for that wonderful fruit/cheese/meat combination that many find very pleasing! I definitely hope this one goes on the new menu and stays there. As for the sangrias, my favorite is the white peach, although I do give the restaurant credit for including lychees in one of the sangrias also. 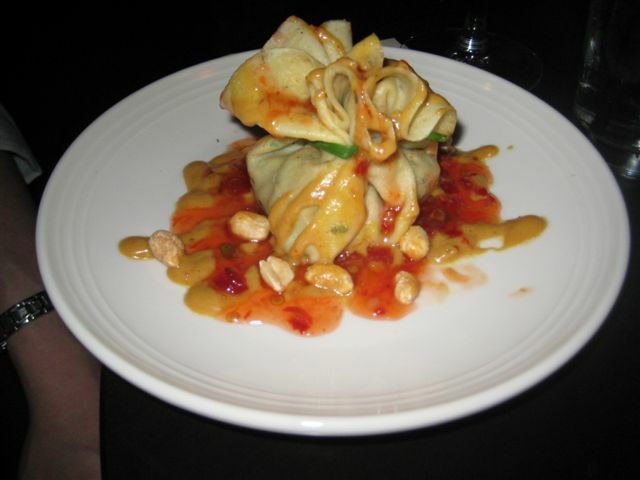 Chicken Thai Peanut Purses with Green Apple Lychee Sangria. My only criticism about this place is that although crepes allow for a beautiful presentation in a variety of ways, the crepes here do not really taste all that different than if the main ingredients were on a plate sans crepe. From looking at the menu, the rich, long list of ingredients in most the dishes point to this being a problem for many of the selections. Before trying Crepe Revolution, my memory of the tastiness of a crepe stemmed from the actual crepe and still, one of my favorite crepes is simply a plain sweet crepe with cinnamon and sugar, maybe a squeeze of lemon juice. The good thing is that this issue can be overcome by creating your own crepe from "The Crepe Experience" section of the menu - and taking it light on the ingredients. Also, for weekend brunch, crepes are offered simply with maple syrup. Still, I would like to see French crepe classics like ham and gruyere, mushroom with goat cheese and onion and a simple lemon sugar crepe included on the menu - maybe even in their own section - to inspire people to taste the quality of the crepe itself instead of the quality ingredients in the middle. I definitely do recommend Crepe Revolution and I look forward to trying more dishes there. 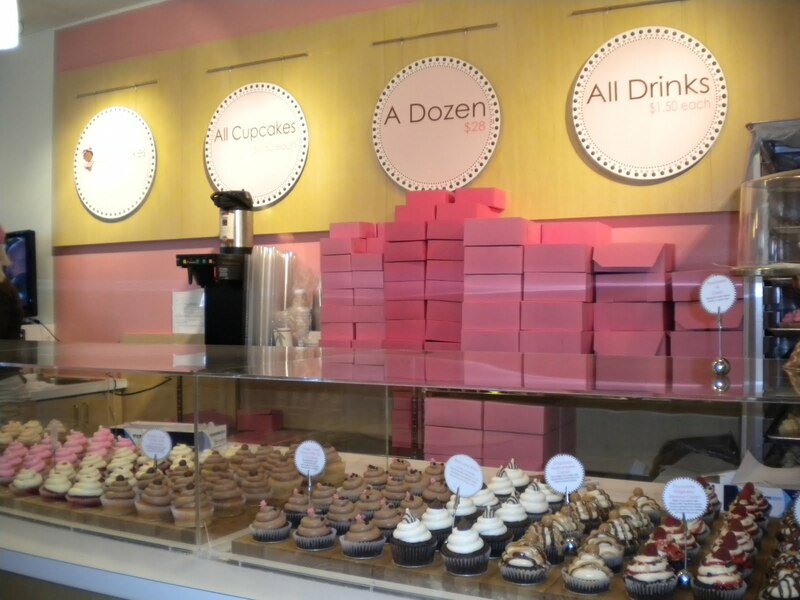 Could an intown location be on the horizon?! Let's hope so. Crepe Del Mar with Kiwi Grapefruit Sangria. Bananas Foster Crepe - yum! 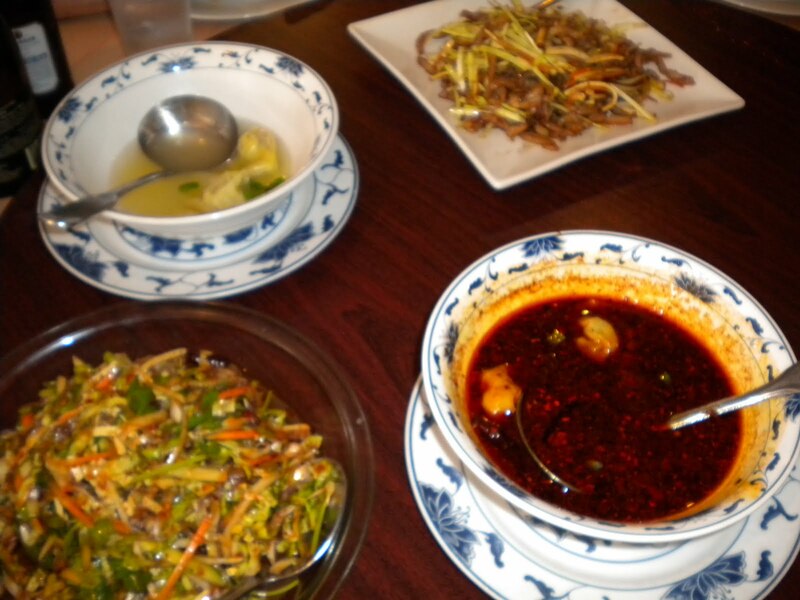 Clockwise from bottom left: Chinese salad (off menu), baby wonton soup with chicken flavor, spring onion with pork and baby wonton soup with spicy and sour sauce. After years of hearing about Tasty China, I finally had a chance to try it with a few family members. 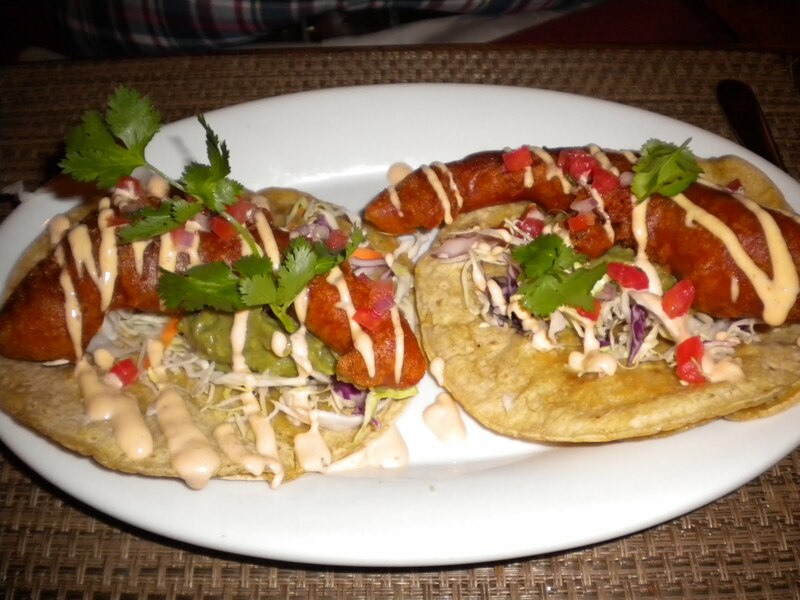 Divided between fans of extreme spice and those looking to keep their taste buds intact, we tried menu items from the spicy and not so spicy realms of the menu. The Chinese salad, an off-menu special, delighted with it's spicy, fresh flavors. I also loved the wonton soup with spicy and sour sauce - and they are not joking about the spice. Somehow it gets easier to eat the more you've had; perhaps some of that numbing pepper is included in there! Dry fried eggplant with hot and numbing pepper. The spice fans also really enjoyed the dry fried eggplant. 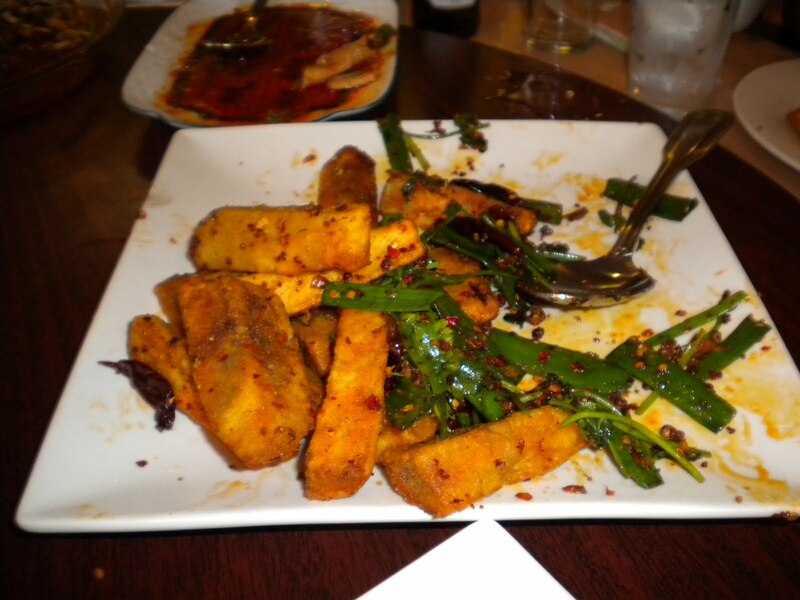 With just the right amount of crispy spiciness, this dish is a true Sichuan special. Honestly, I don't know of any other place in the Atlanta area with food like this - although I've never traveled to China, in my mind this is what I think authentic Sichuan food tastes like. "Alive" fish - talapia pulled from the tank near the door before steaming. Deliciously fresh, light, flaky fish was gone before we knew it! 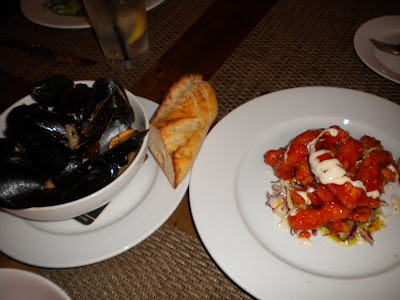 Angry mussels and calamari "fries". We tried another "new to us" restaurant while in Charlotte. 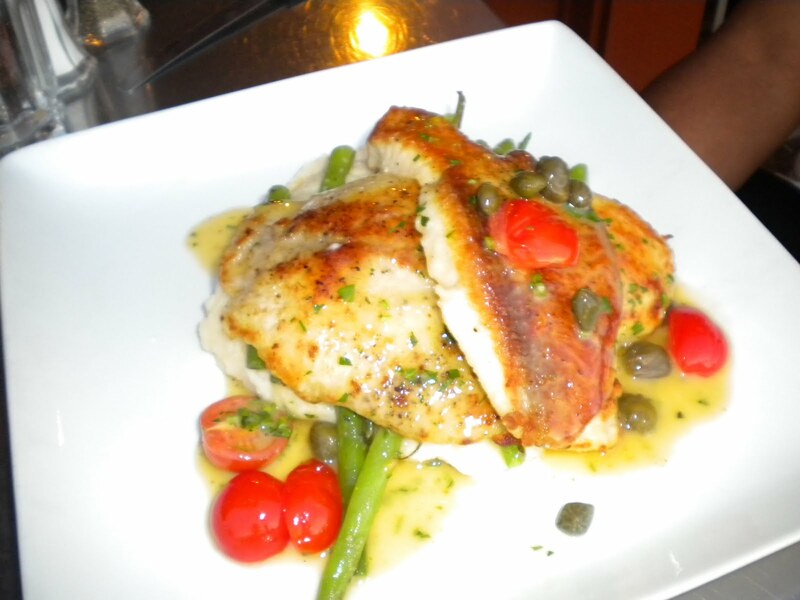 The Liberty (in the old McIntosh's Steakhouse space) is an interesting blend of gastro-pub and gourmet. The angry mussels a friend of ours described as unbeatable were very tasty, but the calamari "fries" our waiter pushed were overbattered, oversauced and tasteless (other than the sauce). 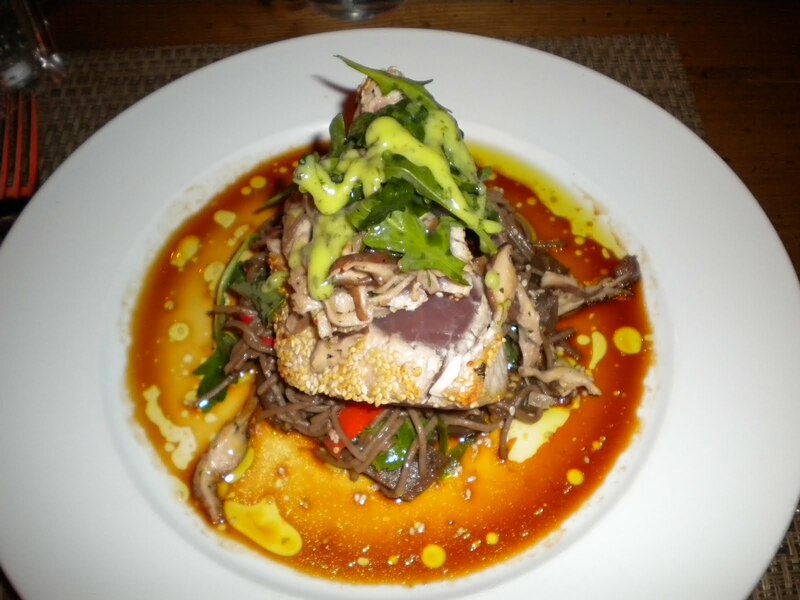 I really did enjoy the seared tuna entree - it contained both soba noodles and wasabi - two of my favorites. The portions are quite large for the prices, making for a stark comparison with Good Food on Montford (see previous post). Calvin seemed to enjoy his Calabash plate - fried shrimp and fish with fries and hush puppies. I was surprised at the size of the shrimp, having actually eaten shrimp in Calabash, NC where they are tiny and nothing like these large ones. The fish tacos and the trout, two other good choices my parents enjoyed, were also tasty. The Liberty seems to do quite a few things well and boasts an eclectic menu. With tons of beer choices, it's bound to be a South End hit. While I do miss McIntosh's - one of the few steakhouses I really enjoyed, Liberty is a fine choice for a good meal at a good value. Seared tuna with soba noodles and a wasabi sauce. 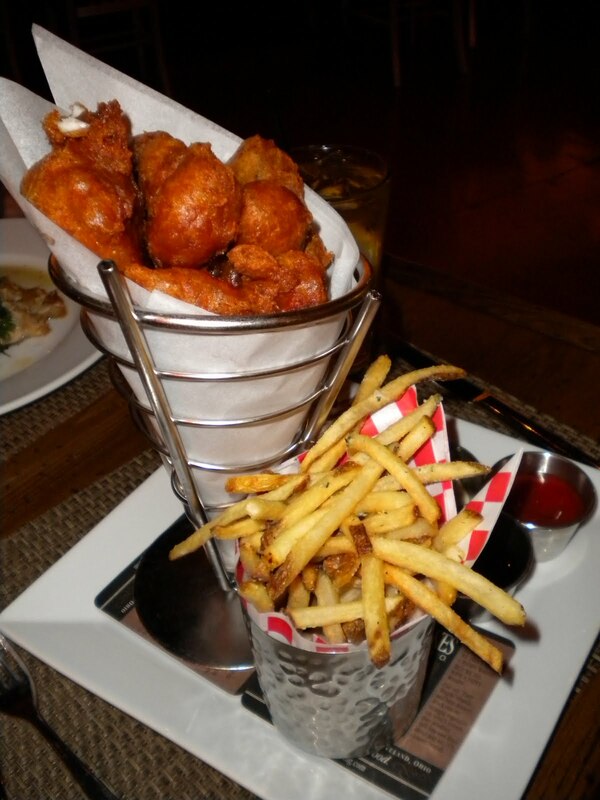 Calabash fish and shrimp basket with hush puppies. Several weeks ago while in Charlotte for some wedding planning, we dined at Good Food on Montford for the first time. Montford Drive is a street with a long culinary history for me, with such favorites as The Ole Smokehouse, the Roasting Company and Luisa's Pizza. 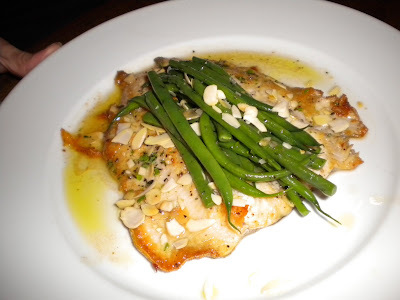 In contrast to those places, Good Food on Montford is more upscale, serving mostly small plates at fairly high prices. 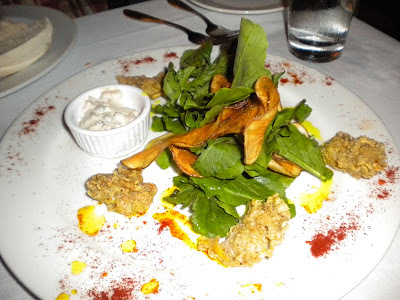 Several of the plates we tried were outstanding, including the ceviche, the mushrooms, the lamb tangine and the fried oysters. We also really enjoyed dessert, especially the cherry cobbler with ice cream. My complaints about this place include the noise - so loud we could not hear each other despite being at a table for six closest to the front window - and the prices. 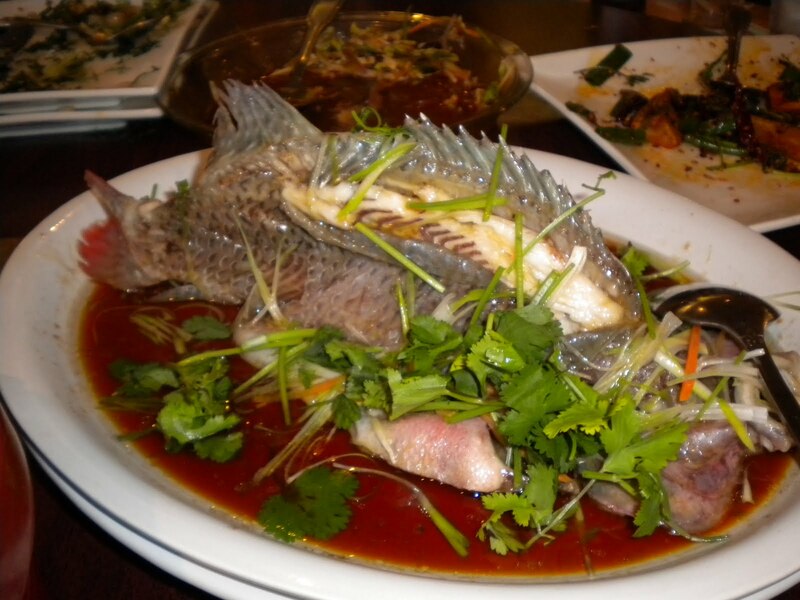 Even my dad's "large plate" of fish was quite small and at $17, not exactly inexpensive. 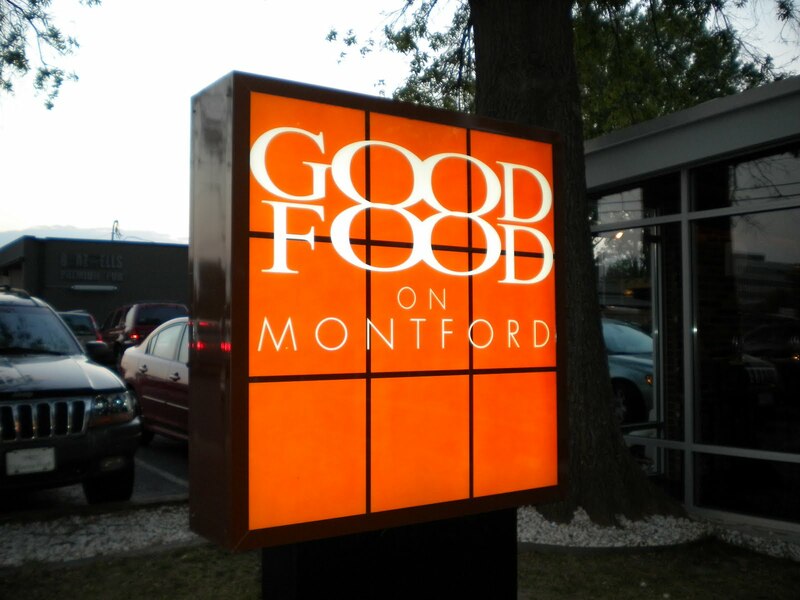 I am glad that Charlotte's restaurant selection is growing so rapidly, and certainly the food here shows a sophistication never before seen on Montford Drive. Although it's not a restaurant for everyday dining, I'd definitely return here for another tasty meal. Although I'd visited Franco's several times for lunch with my office, Calvin and I never tried it for dinner until several weeks ago. This place is in a good location, although the scenery is not the most gorgeous where Cheshire Bridge splits off from Piedmont Road. Still, we very much enjoyed sitting out on the patio and chatting with one of the people who run the restaurant. Franco's is family-run, and although they do not currently have a dedicated website, one is on the horizon. 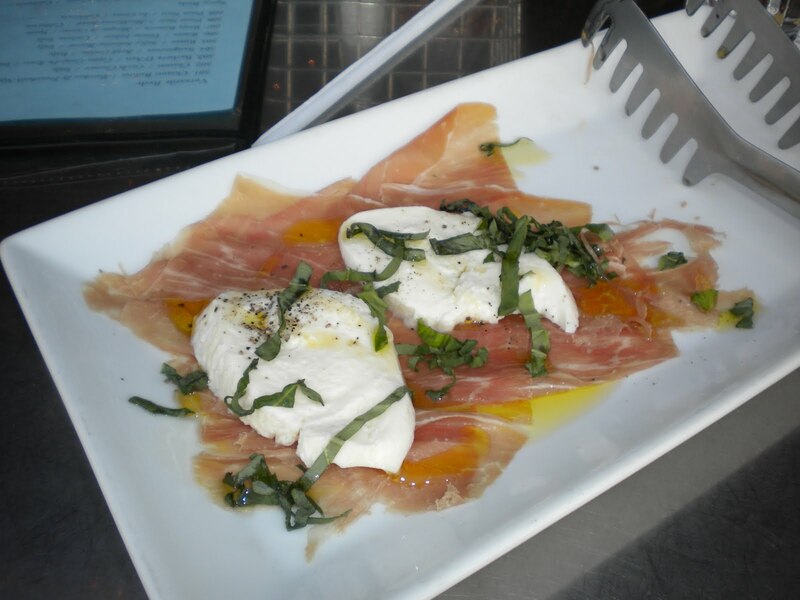 We started with proscuitto and mozzarella as well as bruschetta. 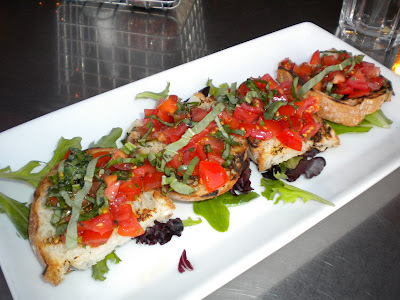 The bruschetta definitely took the cake - very fresh and on warmed toast, it was one of my favorite parts of the meal. This proscuitto seemed too salty to me and although I normally like it, even with the creamy fresh mozzarella, I found this particular variety a bit too overwhelming. 4 Cheese Pasta with Sun-Dried Tomatoes. Our entrees were both wonderful - although the sauces used in some of the dishes are, as one would expect, very rich. 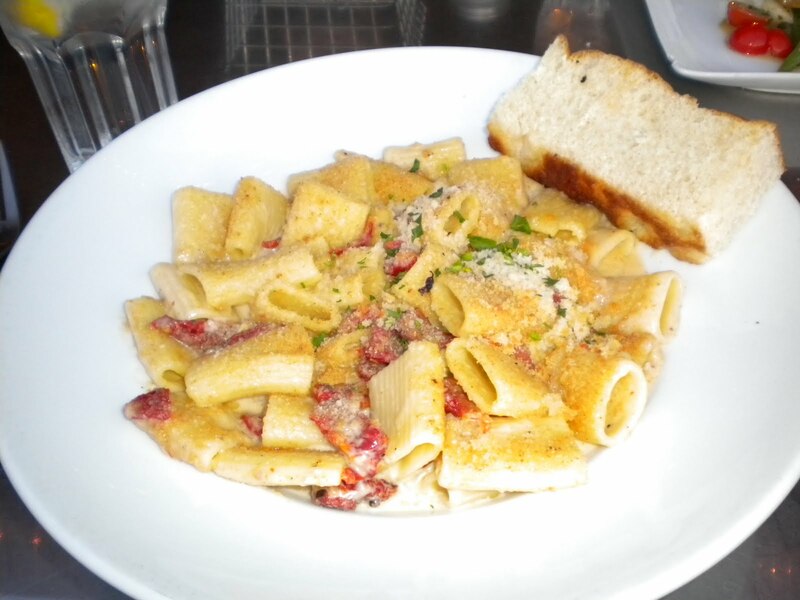 The four cheese pasta, accented by sun-dried tomatoes, kept me interested, although I had to take about 1/4 of it home. The fish entree special really impressed us and left us saying, "we'll have to come back here soon." Delicious fish special with capers, tomatoes and asparagus over mashed potatoes. Salmon quesadilla - make sure you get some of the chipotle sauce! 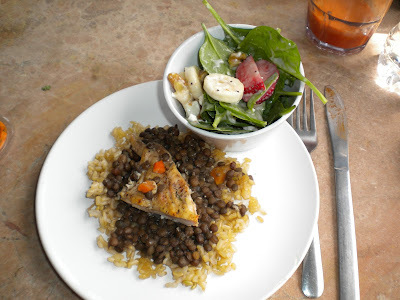 Several weeks ago my friend and fellow blogger Malika (her post on the meal is here) kindly invited me to try Brookhaven Bistro with her for a complimentary lunch. The cafe is located in the back of the Nuts and Berries health food store on Peachtree Road. There are tables inside and outside on a small patio. 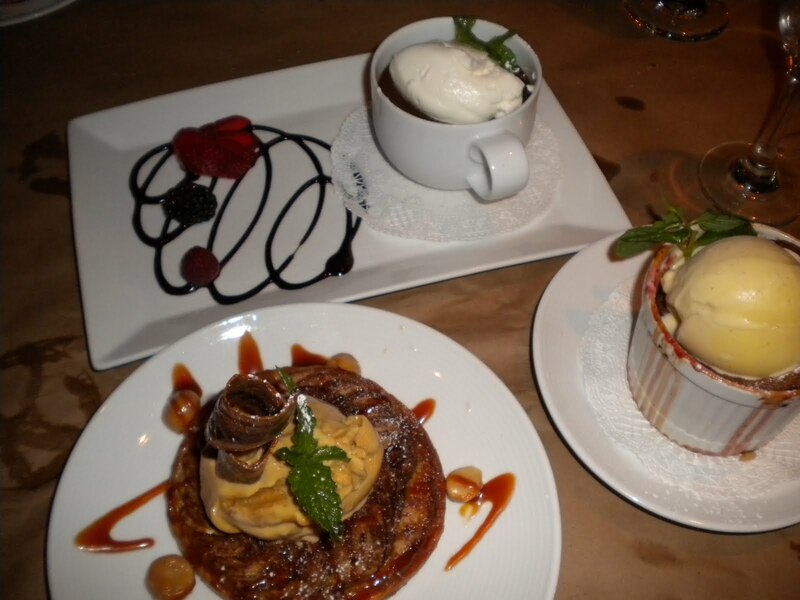 The owner/chef, Chip, prepared a few favorite menu items for us to try. 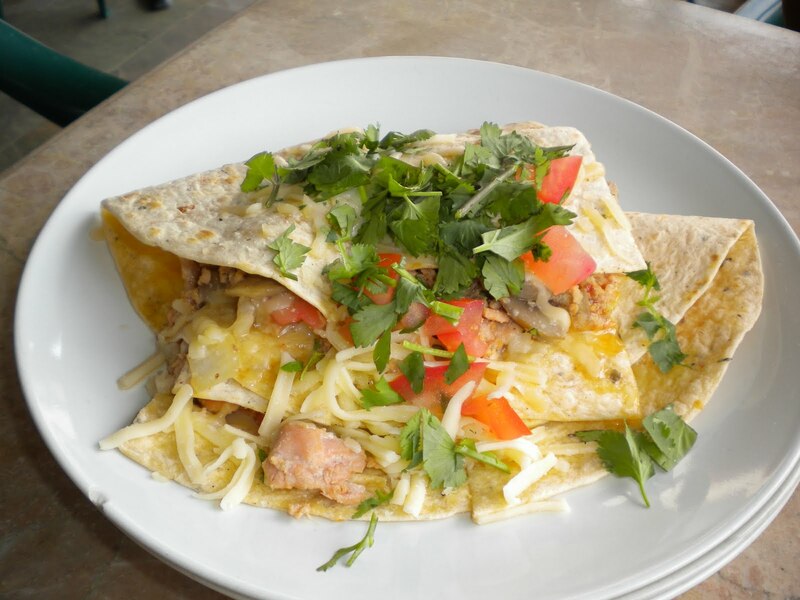 The salmon quesadilla is one of Chef Chip's signature items. It tasted rather bland to me, that is until Chip brought out the spicy chipotle sauce, which really added a nice flavor to the dish. The spicy tofu soup was my favorite dish. Chunky, with lots of greens, rice and tofu in a very tasty (and spicy) broth. Apparently this is not offered every day, but if it is you should definitely try it! 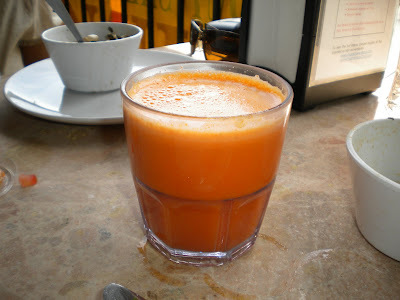 Carrot ginger juice - very good in a healthy kind of way. It tastes like you are drinking your serving of veggies! Tutti-frutti salad (another one of my favorite menu items) along with the chicken special of the day. Menu - you order at the register and your food is brought out to you. To go items available in the fridge case. After a morning hike, on the banks of the Chattahoochee River in Helen, Georgia. On Easter Sunday we took a fun day trip up to Helen, in the North Georgia mountains. 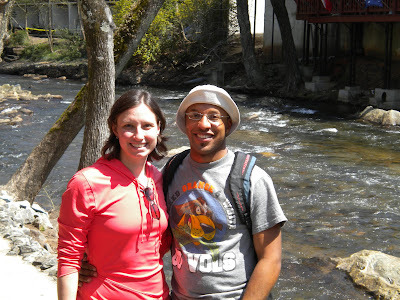 With perfect weather we hiked to Raven Cliff Falls early in the morning, finishing just in time to walk around Helen a bit and have lunch. Helen is a touristy little town, with inner tubing available in summer and buildings made to look like a German village. 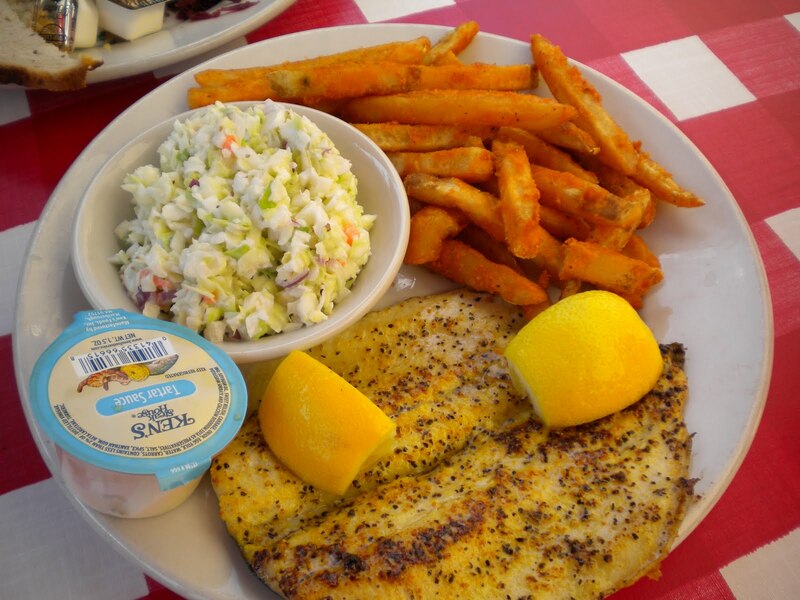 Trout with fries and slaw - note the Ken's tartar sauce! The dining options looked fairly grim from the start. We finally decided on Troll Tavern because of its nice waterside view. Trust me, that was the best part of the meal! 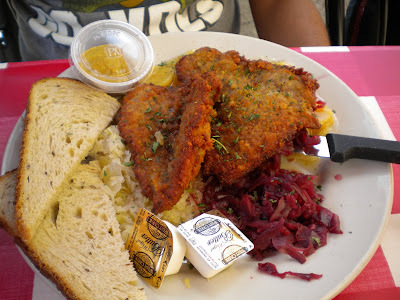 The above fish tasted a little too fishy and the wiener schnitzel was tough. It's a bad sign when the rye bread is the best thing on either plate! Still, it was a really fun day and so enjoyable to be able to hike and eat outside so early in the spring. Next time I'll be researching where to eat! Wiener Schnitzel with sauerkraut and cabbage. Salt and pepper scallops and pork fried rice. 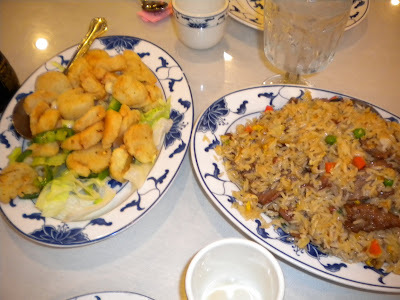 Recently I've become acquainted with Canton Cooks, an excellent Chinese restaurant in Sandy Springs (in the Whole Foods shopping center). There is often a wait on weekends and I've seen quite a few Chinese clientele - usually a good sign. 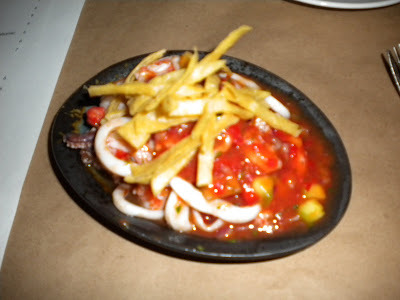 The salt and pepper dishes here - both squid and scallops are quite good. We also enjoyed a duck dish and some wonderful Chinese broccoli. 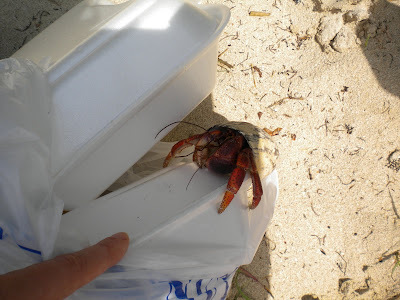 The lobster, available in several preparations, caught my eye last time - we'll definitely have to give it a try soon. 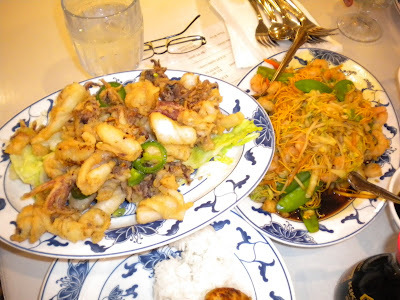 Salt and pepper squid and lo mein. One of my favorite cupcake bakeries is Camicakes in Buckhead. With more than fifteen daily flavors of cupcakes and these cute pink boxes, who could resist trying these little cakes. They taste great, too. 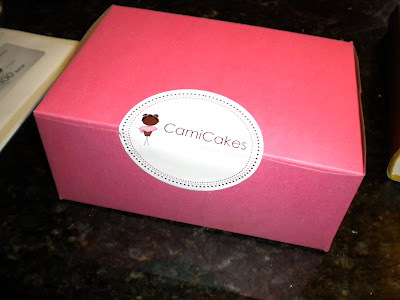 My favorite so far - the sweet potato with cinnamon cream cheese frosting. 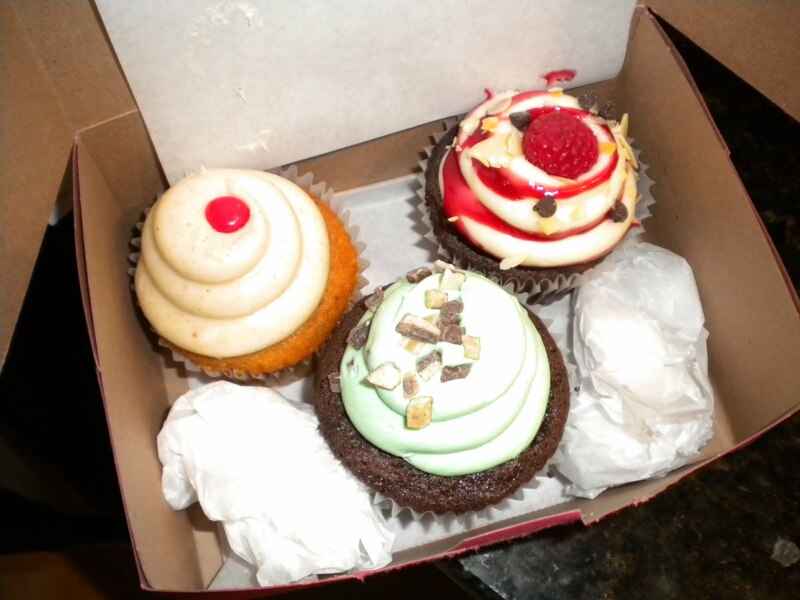 We all enjoyed these cupcakes - then we went again following dinner at Canton Cooks. 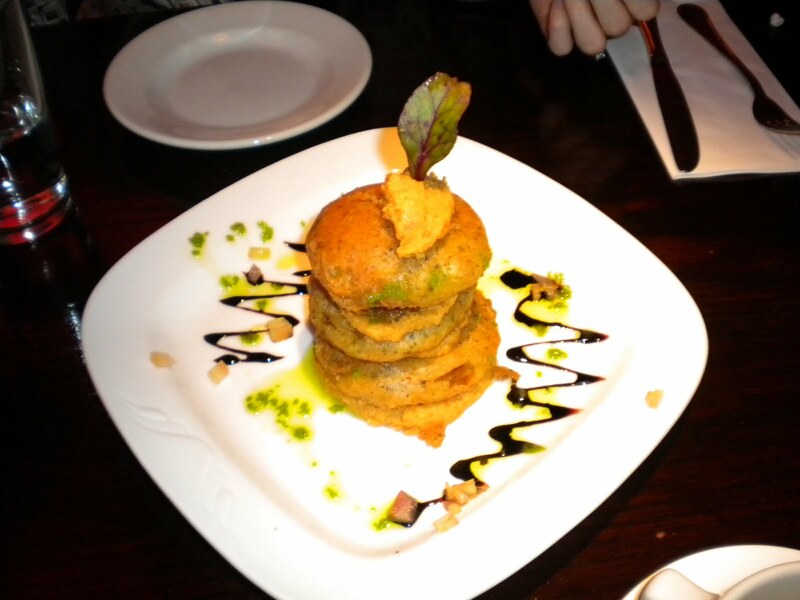 Fried Green Tomatoes - I've shared this on both my visits. 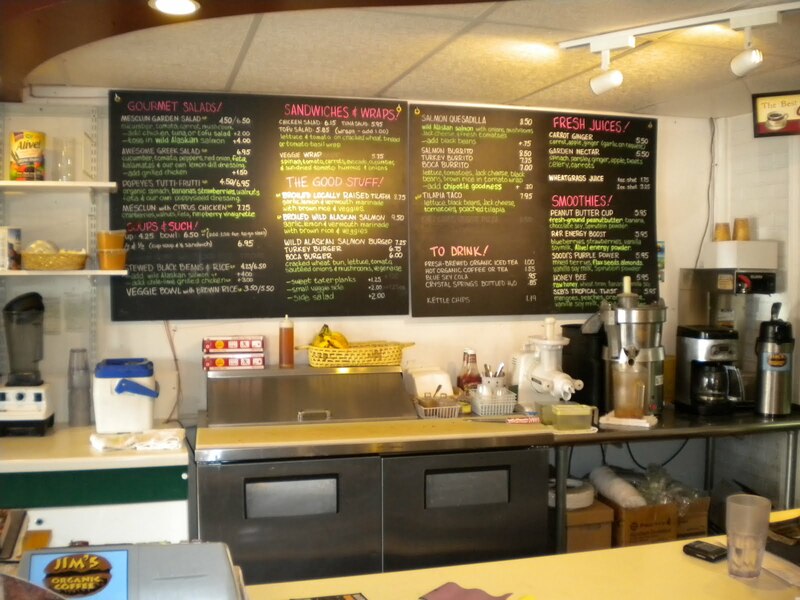 A friend of mine is a big fan of the vegetarian restaurant Cafe Sunflower. When I told her I'd never tried it, she made a meal there happen for me very fast! We've met at the Buckhead location twice now for lunch and it definitely has some of the best vegetarian food around. 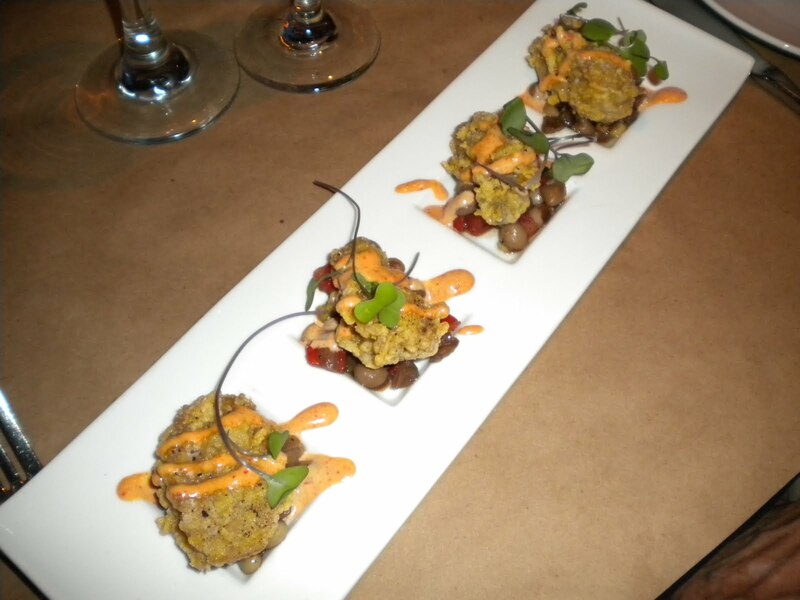 The quinoa dish (photo below) was particularly outstanding and the fried green tomatoes are a must-try. There is a special vegan menu daily in addition to the regular all-vegetarian menu. 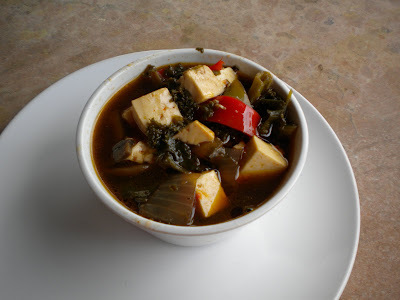 They do have several dishes with tofu/seitan, which can actually taste very meaty. 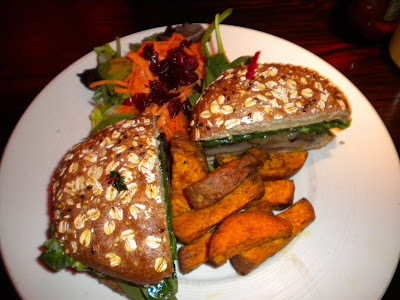 Portabella Mushroom sandwich with baked sweet potato "fries" and salad. 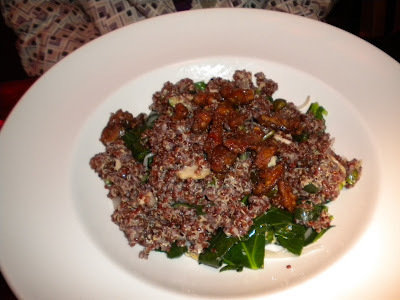 Quinoa with greens and other tasty veggies - one of the vegan specials. One major highlight of the trip - seeing this sea turtle while snorkeling near Mosquito Pier. Back in March I surprised Calvin with a very late and/or very early birthday trip to Vieques, Puerto Rico, a wonderfully undeveloped island off the main island's east coast. 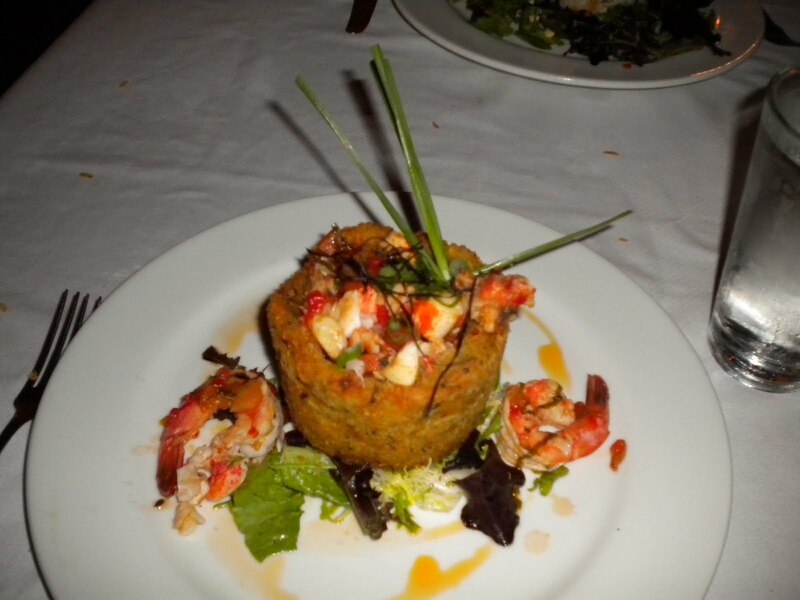 Below are some highlights of our trip, including some culinary delights. 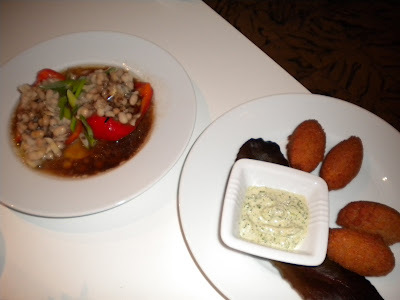 Yautia fritters and bean salad at Conuco, Isabel II, Vieques, PR. The first night we tried Conuco, a little place on the main strip of Isabel II, within walking distance from where we stayed. The fare is purported to be upscale Puerto Rican and we enjoyed it. 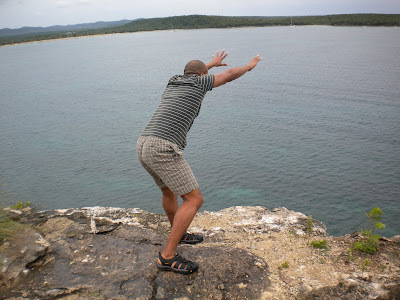 However, compared to the other two places we tried, it was not our most favorite. 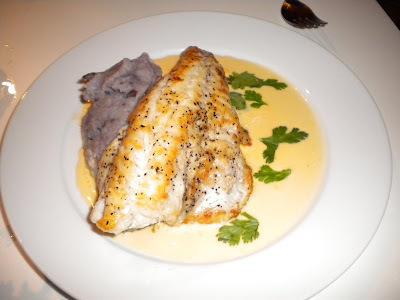 Delicious portion of fish with mashed purple potatoes. 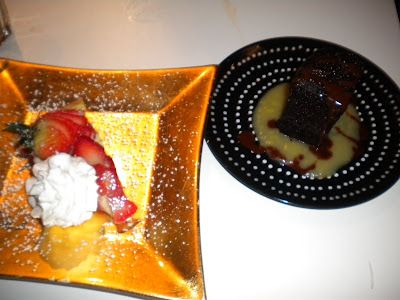 Strawberry tart and chocolate cake. 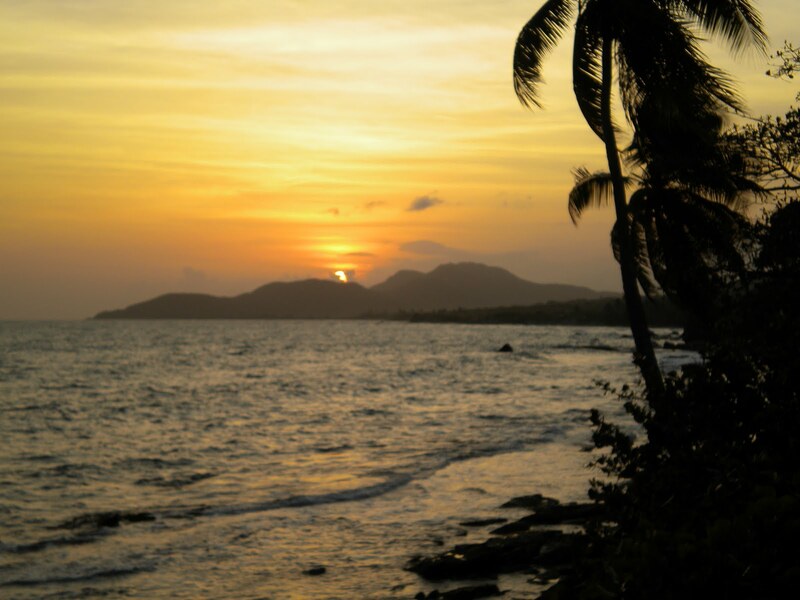 Gorgeous sunset on our second night. El Quenepo in Esperanza - Excellent, high quality food. This was our splurge meal for the trip! 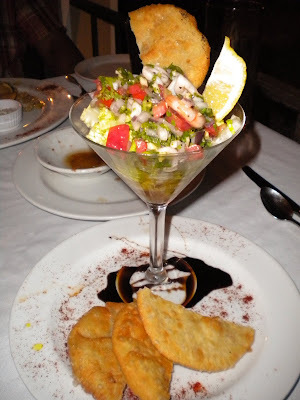 The ceviche was tried was amazing! Fried oysters - good, but not any better than some we get here! 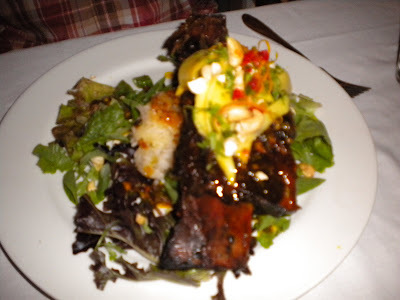 Brontosaurus beef rib - yes it really was huge! With yummy sticky rice and mango salsa - a bit spicy and delicious. 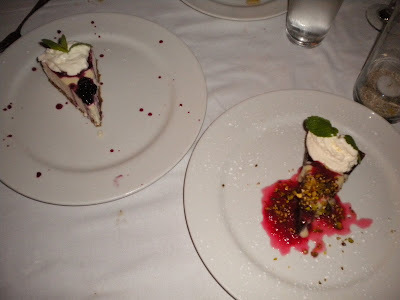 Goat cheesecake and a very rich chocolate dessert - both excellent. 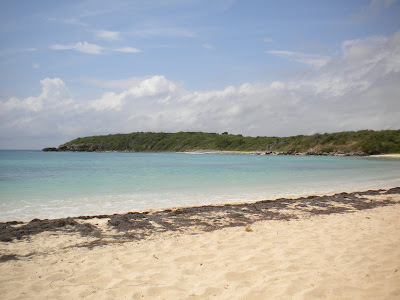 One of the wonderful beaches we visited. 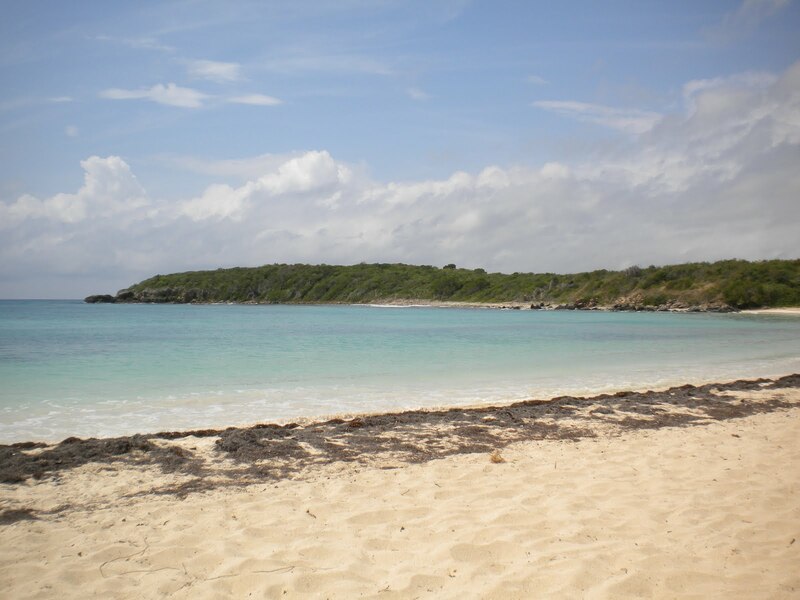 Beach-hopping is one of the favored activities on Vieques. 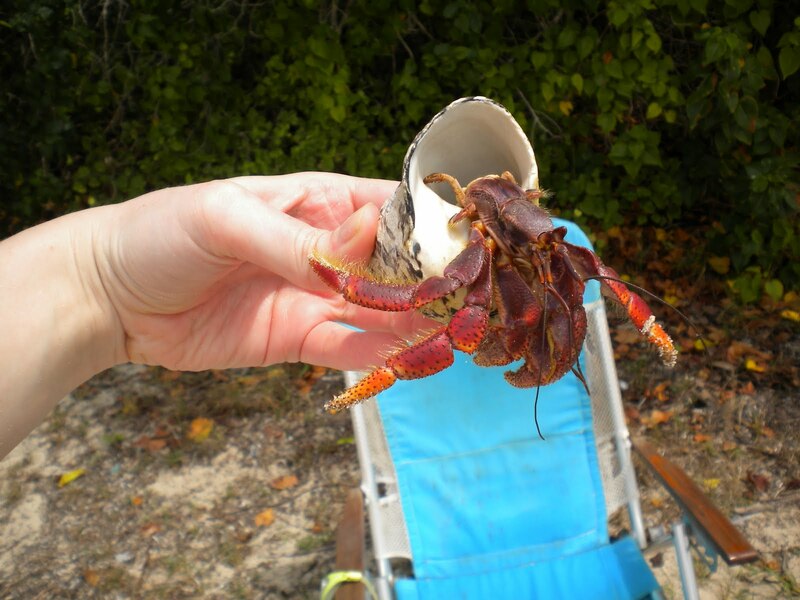 Calvin thought I was kicking the trash bag, but then we discovered it was a hermit crab - a big one! 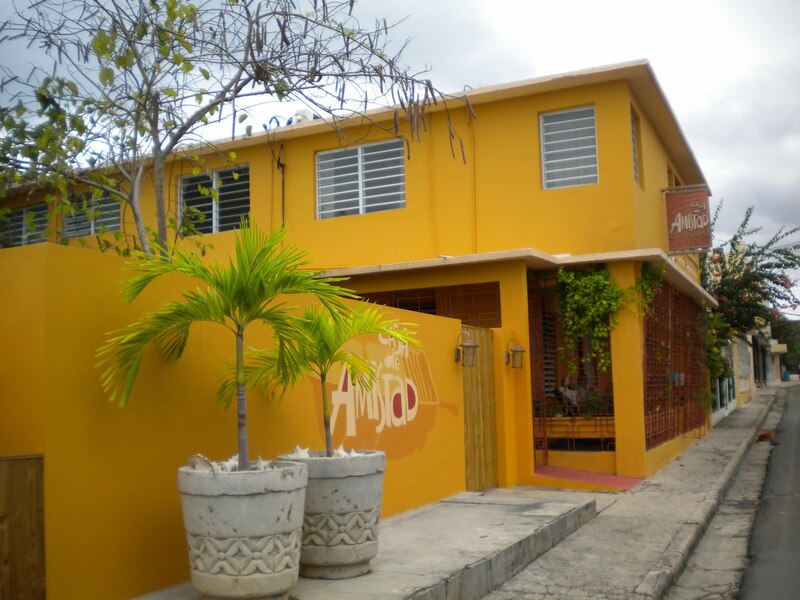 One the way to the beaches on the southeast side of the island we stopped at the Sol Food truck, which produces amazing sandwiches, salads and desserts - you really must try this when you go. 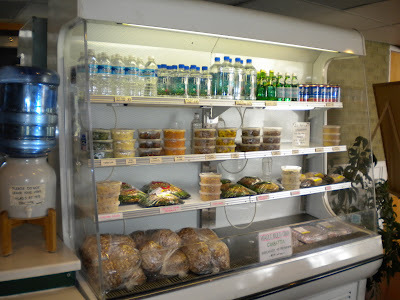 The food from the truck is very affordable, too - unlike the restaurant food, which is, like on most islands, quite expensive. The crab that was IN OUR TRASH! Sushi pizza - tasty although the fish was not exceptional. 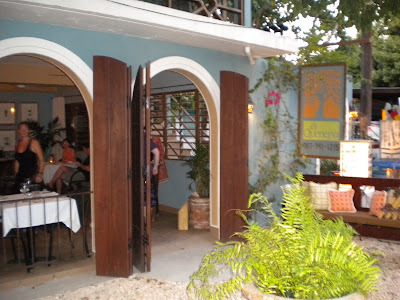 We also dined at Coconuts in Isabell II, the town where we stayed. They have wonderful homemade ice cream. The other dishes we tried were good, too, but nothing outstanding. 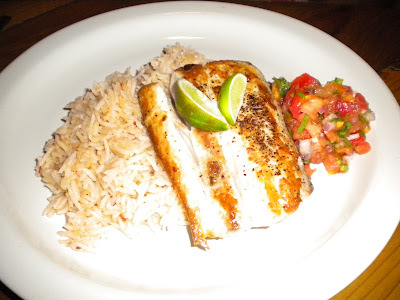 Fish entree with salsa - honestly I cannot remember what kind of fish! Brownie sundae at Coconuts. Their ice cream selection = outstanding, especially the mint chocolate chip (homemade). Calvin pretends to take the plunge! 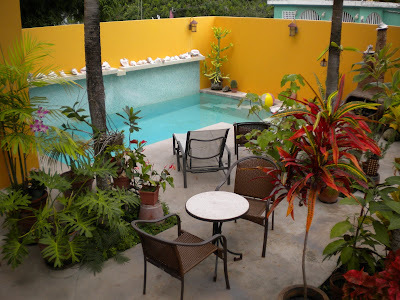 We stayed at Casa de Amistad guesthouse, a lovely small hotel with beautiful courtyard and nice, small pool. You have access to a full kitchen so you can buy food and cook. We thoroughly enjoyed staying here and highly recommend it. View from our prop-plane on the way back to San Juan. On the way over we took a taxi and then a ferry boat. 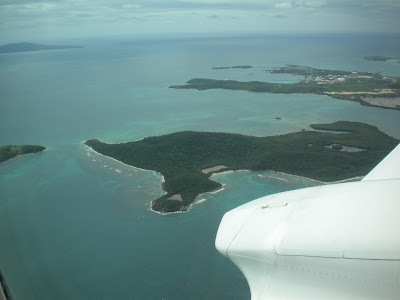 On the way back, we flew, which was fun - only about 7 passengers on the tiny plane - albeit it made me a little queasy!